What we call the human mind is actually the interplay of three brains that have developed over time through the mechanism of evolution. Our brains have evolved over millennia to control our every conscious and unconscious activity, multiplying dramatically its primitive capabilities and our behavior. From physical survival and maintenance (reptilian) through emotions and memory (mammalian), to logic, reason and speech (human) our brains have made a remarkable journey. But, it would be a mistake to think that each ‘brain’ was replaced by the other. Instead each new development was built upon or wrapped around the old one. Each earlier brain still functions as it did but also interacts with the new. 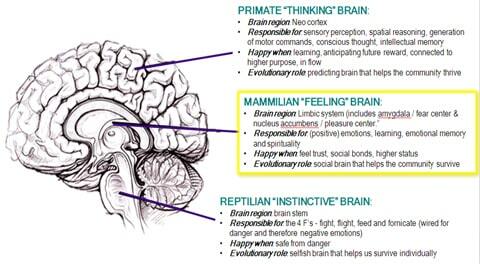 Our earliest brain, the reptilian brain, was developed and IS responsible for our survival instincts. It is made up of the brain stem and the cerebellum and controls movement, breathing, circulation, hunger and reproduction. It is VERY self serving and is concerned with territory, social dominance and “fight or flight” reactions. But because it is so primitive, it cannot tell the difference between what is imagined and what is real. For example when you awake from a nightmare sweating and fearful, the body has reacted to an imagined threat rather than a real one and this is because the reptilian brain’s role in ‘fight or flight’ has been called into play. Our behavior when the reptilian brain is involved is mostly unconscious and automatic. The second brain to evolve was the mammalian brain and is comprised of, among other parts, the brain stem and cerebrum. Involved with emotions, memory and connecting feelings to events it controls hormones and temperature. 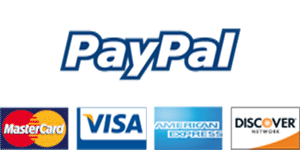 It becomes active when emotions such as fear, anger, frustration and pity are aroused and serves to add an extra layer of control over the automatic responses of the reptilian brain. However, it also operates mostly on a subconscious level and has no sense of time. The most recent brain to have evolved and the most sophisticated is the Neocortex, it deals with evaluation and logic. It is what makes speech and writing possible. It is extremely powerful and even its design (convoluted) is to increase its surface area in relation to size to make as many connections as possible – possible. It’s role is in the higher functions of decision making, purposeful behavior and in seeing ahead to plan our strategies for the future. It specializes in making sense of our senses (sight, sound, touch, taste and smell) and processing the information received. Unlike the other two brains, it operates on a mostly conscious level, and is responsible for voluntary movement. Of course all three brains are connected and each can influence the other. The unique interplay of instincts, emotions and logic with experiences and memories are what gives each of us our individual personalities. Although we would all like to think we are the conscious decision maker in our lives the truth is that psychologists generally agree that at best we are only 20% conscious of our motivations and behaviors. In effect this means that even when we think we are in control and being rational and conscious of our decisions, in fact, we are largely being driven by subconscious directives based upon previous or similar experiences and emotions memories. This means we can often react to things the way we did the first time we ever experienced them regardless of what new experiences or reactions we have learnt since then. In other words we replicate the response and emotional age of the earlier situation. Sometimes our reptilian and/or emotional brain can conflict with our rational logical brain. For example when we know something is not good for us “logically” but we do it anyway. When this happens the conscious brain creates a rational construct to help support our decision. Thereby alleviating some of the contradiction. Because in the end, the reptilian brain or emotional memories (the subconscious brain) always wins. It is the ultimate decision maker. This helps to explain our sometimes self sabotaging behavior when we realize that perhaps only 20% of our real decision making or reaction is done consciously by US. Uncovering originating events that created false beliefs that are no longer serving you – can be liberating. The good news is this. There are ways to eradicate old thought patterns based on outdated reptilian instinctual or mammalian emotional memories embed deep in our subconscious brains and replace them with the correct programming through the use of subliminals. By using this amazing audio technology we are able reprogramme our minds to think, act and behave in more appropriate ways, that better serve us.